Killing four people and damaging property, flash flood wreaked havoc across Achinathang village on August 4. According to BRO source, the flashflood occurred around 10:20 AM on Khaltse-Batalik road, which is maintained by 81 RCC (GREF)/762 BRTF/BRO (P) Vijayak. A total of four people namely Ganesh Datt, a resident of Pithoragarh, Uttarakhand, Dorjay Namgial, Skurbuchan Khaltse, Nirmal Viku, Nepal and Maya, Kullu lost their lives in the flood. Nearby villages, Dha, Hanu, Hanu thang, Beema remained cut off from Khaltse side due to erosion of 2 km of road of Khaltse-Batalik. People have to take the route via Kargil. A 70- Ft bridge along with its abutment was washed away which further caused blockage of Indus water. 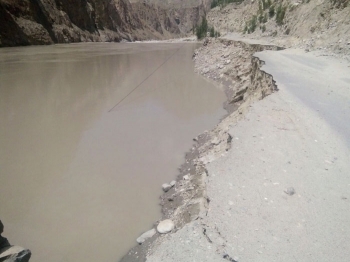 The road of Khaltse Batalik has been eroded due to which the villages like Beema, Dha and Hanu remain cut off from Khaltse side and they have to move from Kargil side. Phuntsog Stanzin, Councillor Skurbuchan said, “We went to the upper reach of Achina Lungpa and found that the flood has been caused due to the glacier melt down because of which the water has been accumulated. The rising pressure of the water leads to the sudden breakdown in the form of the flash flood." Talking about the damages he said, “The newly constructed bridge and the road to Achina Lungpa have been washed away and the villages remained cut off. Approximately more than ₹ 2.00 crores worth road has been damaged. There is no estimation of damaged properties”. “I have requested the concerned departments and stakeholder for the compensation, rehabilitation and restoration. So far temporary restoration has been done”, he added. “The mohalla called Byangthang consisting of ten households, is in danger if hit by another such havoc. There is an immense need to clear the river bed soon”, he added. He further said that the disaster caused heavy damages, washing away the headworks, poplar trees and drinking water pipelines. The temporary restoration work has been started and the tanker of army and PHE distribute drinking water. Dr Sonam Dawa, CEC, DC, SSP visited the site on the same day to assess the ground situation.